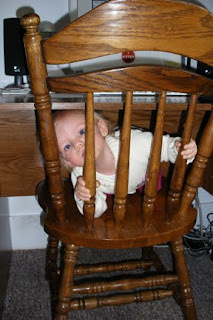 Has been a very eventful one in the life of Claire. First, she experienced her first Aggie Homecoming. Mike insisted that she needed a game-day shirt, which he then insisted be turned into a dress. 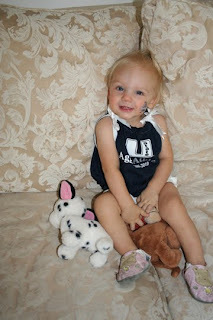 Also note the Aggie bull tattoo on her cheek that Mike purchased for her to wear to compliment her new outfit. 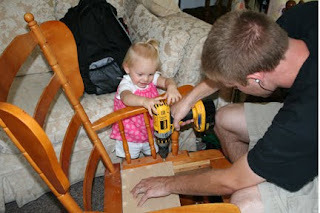 Second, Claire loves "helping" daddy use his tools. 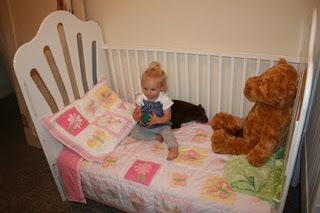 Third, Claire got her new toddler bed set up. She thinks its pretty awesome. 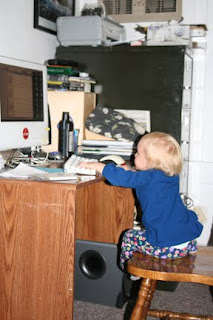 Fourth, she has learned to climb up on our chairs, which has presented a few problems for Mike and I.
Exhibit B - She gets stuck under the desk when the chair is pushed in. 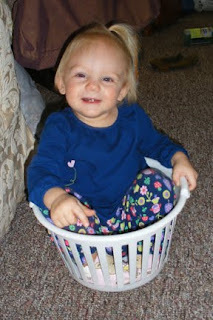 Fifth, She has a new love of buckets. She carries them around, filling them with various items, only to discard those items in random places when more desirable items are discovered. Occasionally she likes to sit in the bucket. 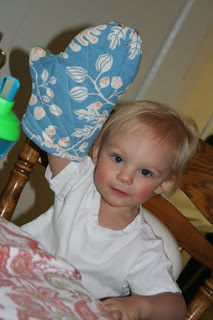 Sixth, she discovered oven mitts. She did so during dinner and insisted on finishing her dinner with her arm in the above position. Finally, Claire learned that Logan is COLD. This week our weather went from 80s to 50s in one day. 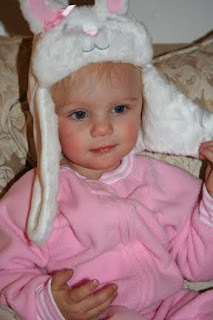 I never get sick of looking at pictures of Claire. She is such a sweetheart!!! 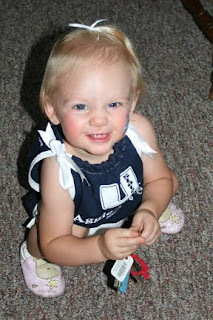 Love the Aggie dress! Since getting my machine, tons of requests for alterations have come out of the woodwork. Lol. I think she looks a bit like Mary in a few of the last pictures. Good luck with the cold. Does Mike always wear headphones when he plays with Claire? 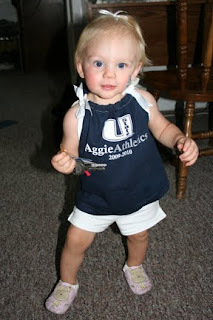 I am a big fan of the Aggie T-Shirt Dress, looks great, it almost makes me want to go to Aggie Days.